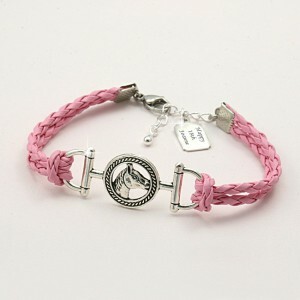 Personalised Leather Bracelet with Horse and Engravable Tag. Colour choice of black, pink or brown. Free Engraving is included on the tag shown. Made with durable leather braided cord. Available in girls or ladies sizes. « Sterling Silver Love Heart Necklace With Choice of Engraved Tag.